For the first time, pioneering farmers and partners gathered in Salem on Wednesday, February 6, to educate, celebrate and meet with lawmakers to underscore the important role organic plays in Oregon. Organic Valley, America's largest cooperative of organic farmers and a leading organic brand, partnered with Oregon Tilth, Oregon Organic Coalition, the Organic Trade Association, OMRI, Hummingbird, Mountain Rose Herbs, Friends of Family Farmers, Organically Grown Company, Oregon State University College of Agricultural Sciences and Oregon State University Extension Service to host the organic education and awareness luncheon event in the state Capitol. 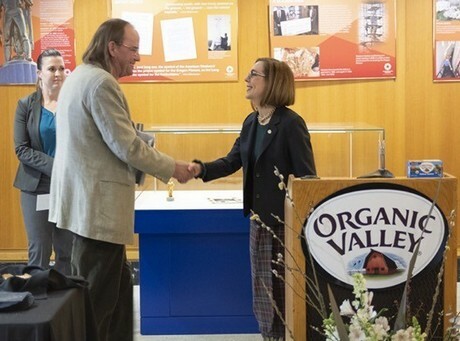 Goals of partnering and amplifying organic in Oregon developed as the cooperative opened its first brick-and-mortar outside of Wisconsin, the McMinnville Creamery, in August of 2017, adding 50 jobs to the state and a $21 million capital investment. Oregon is already a natural leader in organic—with 864 certified organic operations and $350 million in organic farm gate sales, it's ranked 9th in the nation and has received more than $13 million in federally funded organic research. In Oregon, where the top organic products are milk, alfalfa, potatoes, cattle and berries, there are 176,000 certified organic acres, and 91% of households purchase organic products.